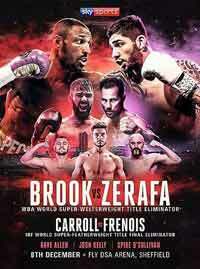 Review by AllTheBestFights.com: 2019-03-15, good fight between Tevin Farmer and Jono Carroll: it gets three stars. The Ibf super-Fw champion Tevin Farmer entered this fight with a professional boxing record of 28-4-1 (6 knockouts) and he is ranked as the No.5 super featherweight in the world (currently the #1 in this division is Miguel Berchelt). He suffered his last defeat in 2012, against Jose Pedraza, but then he has collected 21 victories and one no-contest defeating Billy Dib (Tevin Farmer vs Billy Dib), James Tennyson (Tevin Farmer vs James Tennyson) and Francisco Fonseca in 2018 (Tevin Farmer vs Francisco Fonseca). His opponent, the undefeated Jono Carroll, has an official record of 16-0-1 (3 knockouts) and he entered as the No.37 in the same weight class. He fought twice last year beating Declan Geraghty and drawing with Guillaume Frenois (Jono Carroll vs Guillaume Frenois). 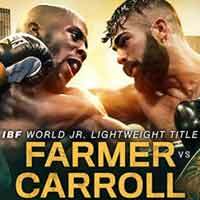 Farmer vs Carroll is valid for the IBF World super featherweight title (Farmer’s third defense). Watch the video and rate this fight!